Yippee!!! 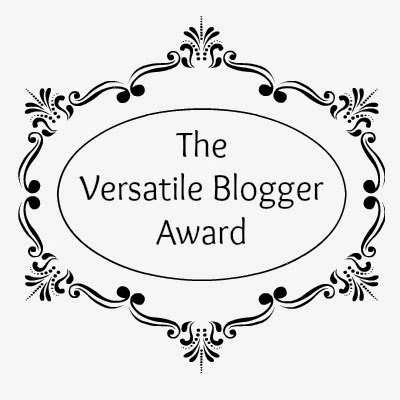 I have received the Versatile Blogger Award! I am sooo soo happy as this is my second blog award after My Liebster blog award ! 1. Link back to the person who gave you the award. 2. Share seven things about yourself. 3. Pass the award to fifteen bloggers who you think deserve it. 4. Contact the people you've nominated. 4. I am a foodie. BIG time! 5. Experimentation is my thing I do not like same things all the time. 6. Classics are my favourites and don't like anything that is too loud or too flashy. 7. Though I am new to blogging I have fallen in love with this :D.
Congratulations everyone! Hope you all are happy as I am :) ! Thank You So Much Priyanjana :) You are really kind and sweet. Congrats Priyanjana for winning the versatile award !! Your have an awesome blog dear ! I loved to ! Thanx so much for the award Priya! Loved ur blog!